Those of you who've been modeling a while are familiar with the Archer Fine Transfers' line of markings. What is especially nice with Archer's products is that they are dry transfers, so you don't have to gloss coat your armor model just to avoid the ever-present threat of decal silvering. This set is designed to enhance the beautiful Tamiiya Humvee kits released in 1/35 scale. You can see in the images above that Archer has replicated the interior placards that are prominent on the dash board and around the interior, plus the second set to capture the maintenance stencils placed around the exterior of the vehicle. These are visual details usually overlooked by the kit manufacturers and even modelers, but when you see one in person up-close, you can definitely distinguish these features. This set is a must-have for your next (and all of your) Humvee project(s) and are simple to use. 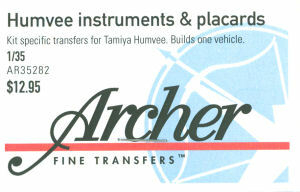 My sincere thanks to Archer Fine Transfers for this review sample.